Catena Creations first redesigned the site for Akridge & Akridge Chiropractic in 2014, and continued to maintain it after the launch. 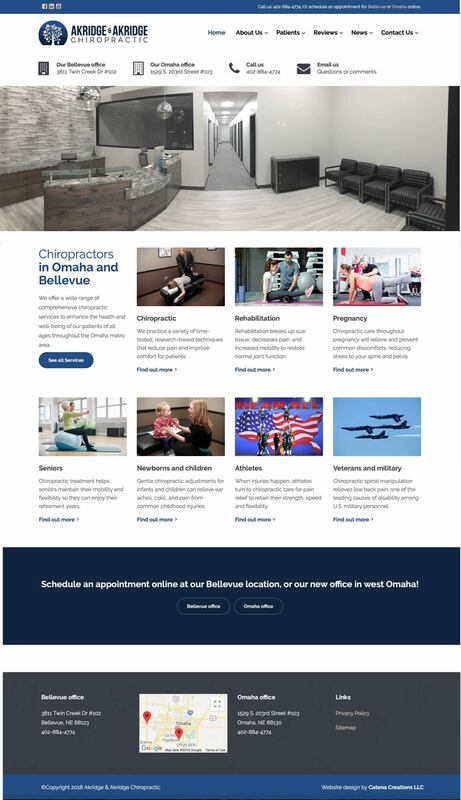 A redesign was planned for 2018 to highlight the opening of their second office in Elkhorn, while enhancing search engine optimization for the Bellevue office as well. All content was reviewed for clarity and effectiveness. The chiropractors added seven pages to better describe their speciality services. Separate contact pages were set up for the Bellevue and Elkhorn offices so patients can easily find maps and phone numbers for the location they prefer. The site was launched in September 2018 when the Elkhorn office opened.